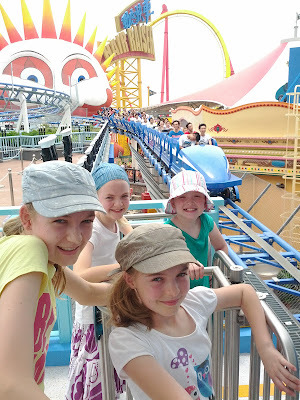 We allowed the Peets one day to recover from Disneylanditis, then we dragged them to Hong Kong's other main family attraction: Ocean Park. Ocean Express: "Come for a fantastic journey on the Ocean Express, the latest quick, smooth, thrilling and fun way to travel from Ocean Park's Waterfront to the excitement at the Summit. The train is designed to resemble a submersible vehicle, and offers a vivid experience that simulates a journey through the ocean's depths." Arctic Blast: "Step onto the Arctic Blast, your unique roller coaster experience! A fun-filled ride for the whole family, don't miss this all new attraction to complete your polar journey." South Pole Spectacular: "Come to the South Pole Spectacular to see over 70 penguins from three species. This expansive area spans a viewing chamber, glass-panelled floors, walkways and balconies overlooking the water, in an eye-opening experience that surrounds you in the world of penguins." It was freezing in the South Pole Spectacular room! The Rapids: "Water is the source of life in the rainforest. As you strap yourself into the raft, a booming voice warns you of the dangerous Rapids ahead, and the adventurers who never make it back. 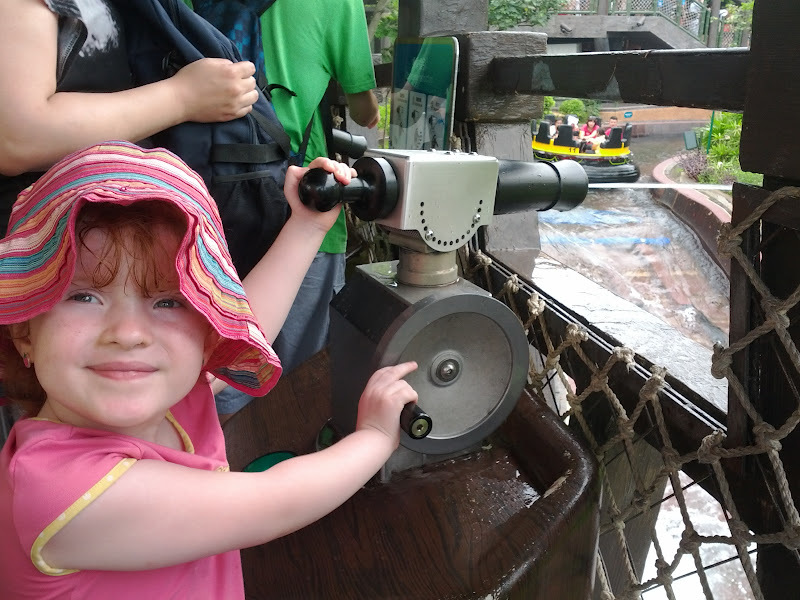 This exciting interactive river ride takes you on a fun exploration of the rainforest. But watch out! With the possibility of sudden water gun attacks from overhanging suspension bridges, you’ll be trying hard to watch your back as the waves throw you from side to side." We got soaked on The Rapids but dried very quickly in the sweltering sun. 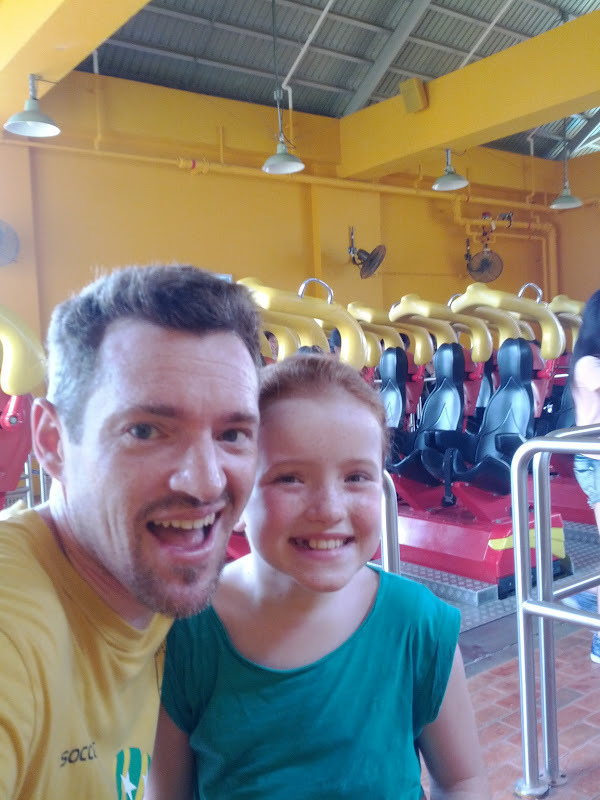 The Hair Raiser: "Hurtle, plunge and loop around with your legs in the air at a massive 4G, all the while suspended high above the South China Sea. 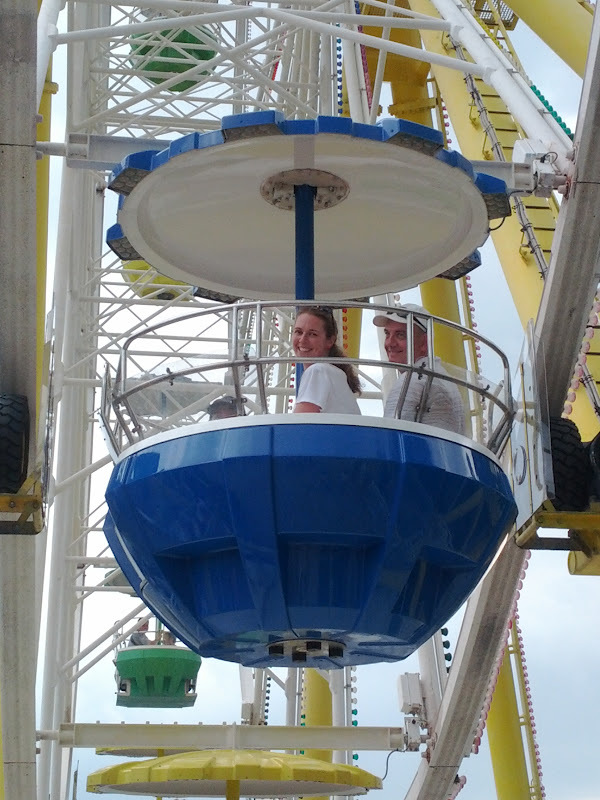 The Hair Raiser is literally floorless, resulting in a faster, wilder and more exciting ride than ever before." Expedition Trail: "The Rainforest is home to a global heritage of flora and fauna. This Expedition Trail takes visitors on a hands-on journey through the habitat of some of the rarest animals in the world. Come catch the antics of the Pygmy Marmoset, the world’s smallest monkey, the Hercules Beetle, the world’s strongest animal capable of lifting 850 times its own body weight, and the Kinkajou, showing for the first time in Hong Kong. See weirdly wonderful critters like the Capybara, the world’s largest rodent, and the Arapaima, the world’s largest freshwater fish from South America. Spot the colours of jungle gems like the Poison Frog and Red Eye Tree Frog. Welcome the world’s largest toucan, the Toco Toucan, and mark the debut of the world’s smallest toucan, the Green Aracari." Ocean Park Tower: "Extraordinary vistas are revealed as you soar 72 metres into the air. Stunning views of the South China Sea can be yours from atop Ocean Park Tower, located 200m above sea level, where a gently rotating viewing room provides 360 degrees of sun, sea and sky. Ranked as one of the tallest observation towers in Southeast Asia, guests will be able to see clear to Aberdeen and the outlying islands." Pacific Pier: "View the rocky coastal habitat of seals and sea lions as they frolic, sunbathe and hunt beneath the waves. This interactive exhibit allows you to go under the pier and see these agile creatures in the water, complete with simulated waves. Twenty resident seals and sea lions are waiting to say hello." Raging River: "Follow in the footsteps of old-time explorers as you climb into your log boat. Splash your way past calm channels, anticipating the wilderness beyond. Crash down rapids in your boat, navigating through narrow ravines, snaky slopes and chilling hairpin turns. Twist your way towards a spectacular vertical drop – and plunge into the mist below at a speed of over 58 km per hour." Ferris Wheel: "Board the gondolas for spectacular views of Ocean Park and the South China Sea on this all time family favourite. 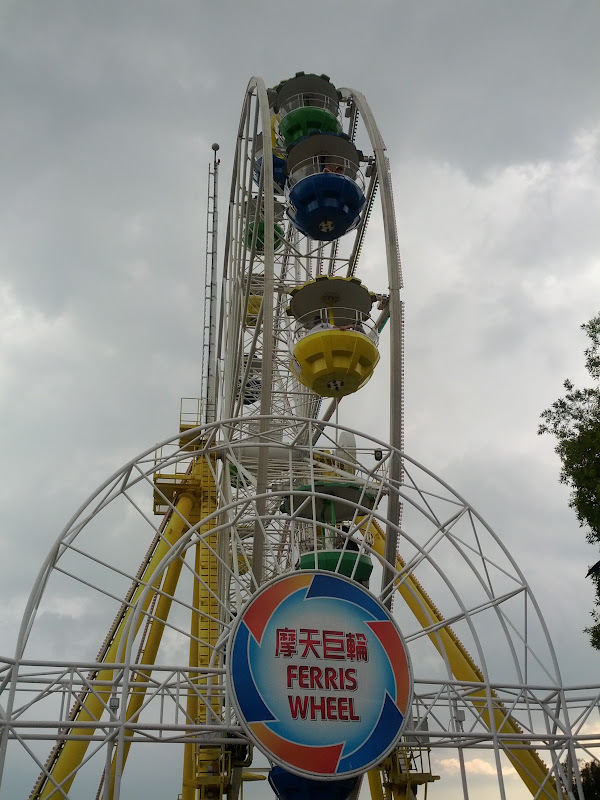 This 24 metre Ferris Wheel offers numerous opportunities for snapshots with friends and family against stunning panoramic scenery." Mine Train: "Experience Ocean Park's craziest ride yet! Nothing runs as wildly in the West than this runaway Mine Train. Think you have what it takes to be a cowboy? Tether on the brink with only the sea beside you, and 85 metres of nothingness between you and the ground. Hurtle down one slope at breakneck speed – just in time to catch your breath over the next edge. Over half a kilometre of track awaits to take you screaming into the horizon and back." Eagle: "Watch this beautiful bird take flight in a stunning display of fiery lights. Its gravity defying spins rise up towards the sky and split apart, displaying four individual pods of screaming passengers, all holding on to their dear lives. With a central rotation speed of 8 revolutions per minute, and a shocking gyro drive speed of 22 revolutions per minute, the Eagle delivers maximal fun at dizzying proportions." 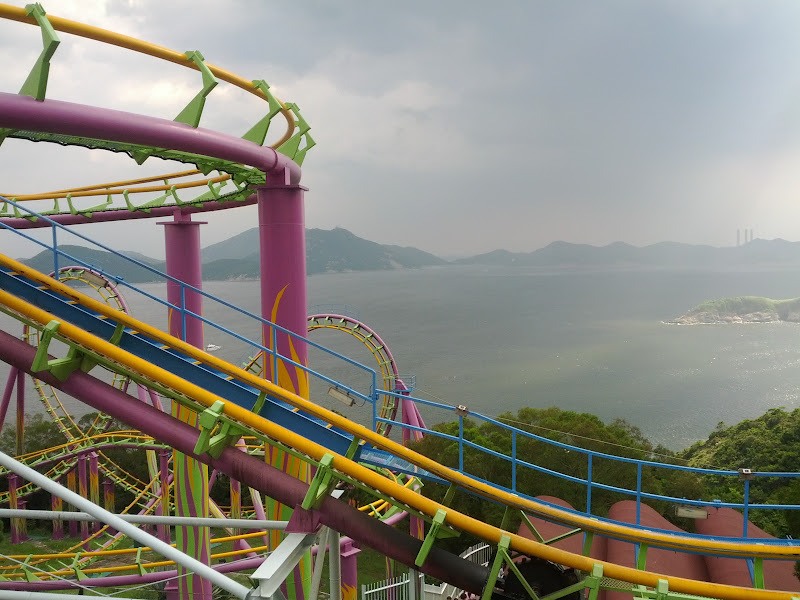 The Dragon: "Like its legendary namesake, nothing else twists and turns in Ocean Park more than this steel monster. With corkscrews and full 360° rotations to tear through at the speed of a hurricane, this attraction is a thrill seeker's dream. No one escapes without the fright of their lives!" Cable Car: "Cable Car is a great way to travel between the Summit and Waterfront. With Ocean Park attractions located on two different sides of a mountain and wide swaths of sea in between, riding the Cable Car provides unprecedented views of the surrounding area, the sea, and the entire park." 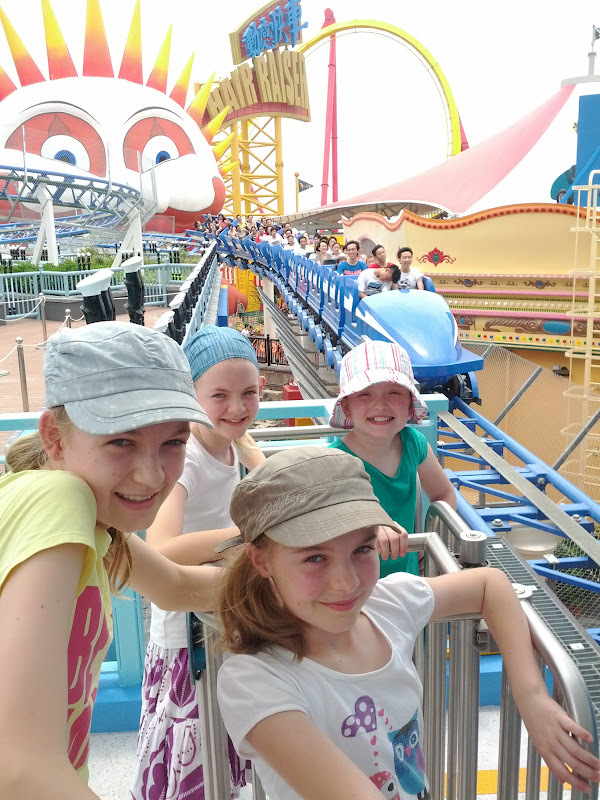 Old Hong Kong: "Ocean Park is bringing back the culture of Hong Kong in the '50s -'70s. Visit this brand new zone to relive the early days of the territory where we grew up! Old Hong Kong will bring back the many memories of life back then, a culture that will be with us forever. Be mesmerized by the colors and activities of life in Old Hong Kong on authentically recreated streets and scenes." Giant Panda Adventure: "Ocean Park is proud to welcome its latest residents from the temperate forest of Mainland China – the cuddly red pandas. Visit these adorable pandas as well as see other Chinese wonders, like the critically endangered Chinese Giant Salamander. Say hello to Ying Ying and Le Le, the eternally cheerful giant pandas." Amanda and I loved this gorgeous fish mosaic. Grand Aquarium: "Dive deep underwater, where bioluminescent creatures glow in the dark and the mysterious shadows of fish flicker by your shoulder. 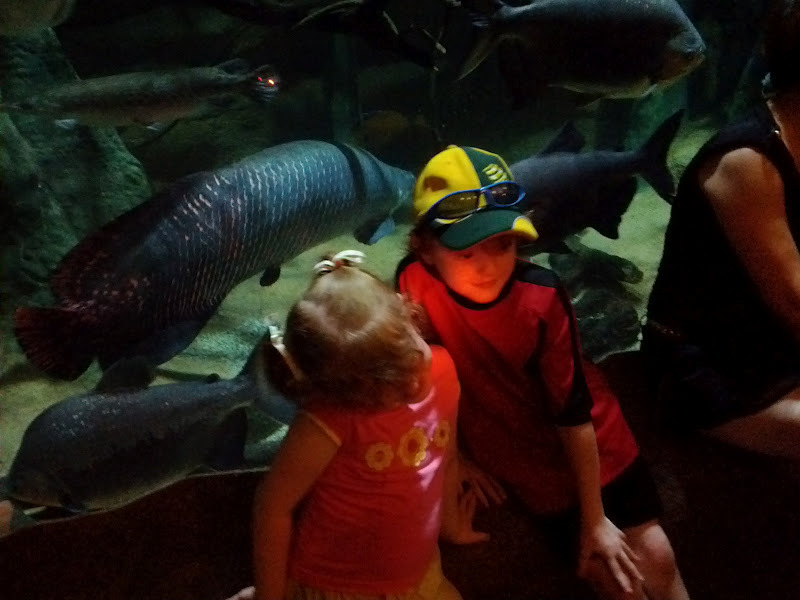 Enter the Reef Tunnel, where you will get a taste of the profoundly beautiful ecosystem surrounding coral reefs. As you descend further around a gigantic swirl tank, look up and admire the schooling milkfish as they glitter like a kaleidoscope of stars. As you walk through the bubble tunnel, remember to peer through the world's largest aquarium dome, which stands at an astounding 5.5m in diameter. Then, take a final dive down into the abyss, where some of the ocean's most bizarre creatures live, before reaching the climax of your journey – an awe-inspiring 13m wide acrylic viewing panel behind which 5,000 fish from over 400 species meet you eye-to-eye." There were several other attractions that we hadn't seen, but with the news that a typhoon was blowing towards Hong Kong we decided to leave the park early. It was only by the grace of God that we soon caught a bus leaving Ocean Park for Admiralty Station. Tirzah was so tired after our full day that she fell asleep against my leg. As you can tell from the descriptions of rides and rollercoasters, Ocean Park is really designed for older children and adults, as many of the rides have a height and/or age restriction. My advice to families is to wait until your children are older (at least eight) in order to enjoy the park more. 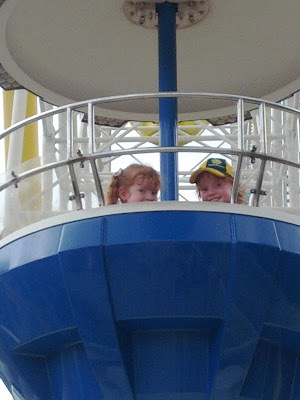 In any case, we were thrilled to have explored Ocean Park for the first time with the Peets. I was so excited to be able to see a real Giant Panda - total highlight for me! i am proud to say that I survived a Typhoon!! !